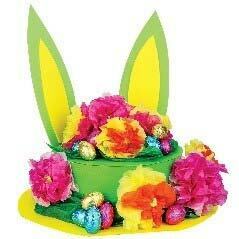 This Easter hat is sure to get an honourable mention in your Easter hat parade. 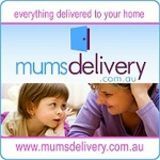 With the cute features you can dress it up or down to suit your child. 1. Using the white bonnets available from Cleverpatch.com.au, begin by giving your bonnet a coat of brightly coloured paint. 2 Assemble your bonnet and secure with glue. Allow to dry. 3 For a hat band, cut a length of crepe streamer and wrap it around your bonnet. Attach with glue. 4 You may also like to add a bow, if so, simply cut another length of streamer, tie a bow and attach to your bonnet with glue. 5 Cut two large ear shapes from foam. Cut two smaller pieces of foam for the inside of your ears. Attach with glue. Allow to dry. 6 To decorate your bonnet with tissue paper flower, stack six tissue paper squares neatly together. Fold the squares like an accordion until you reach the end of the square. 7 Twist one end of a chenille stem around the middle of the folded tissue paper squares. This will hold the flower together. 8 Round off both ends with a pair of scissors. Now, carefully spread out the pleats and separate each layer of tissue paper by pulling them towards the middle. Alternate each side, pulling one layer up at a time. 9 Scrunch up some green tissue paper or cut out some leaves from felt to accompany the flowers you have made. Attach with glue. 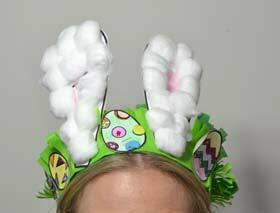 10 Add some chocolate Easter eggs or little chicks around your bonnet by attaching them with glue. 11 Measure a length of elastic under your chin so that it is tight enough to create a strap for your bonnet. Cut the elastic and staple it onto your bonnet brim to ensure your bonnet stays securely on your head. 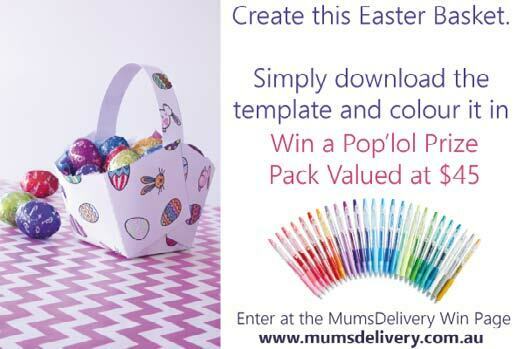 Whether it be because of allergies or simply by parent’s choice, the fact is that there is a growing demand for chocolate-free Easter gifts for children. 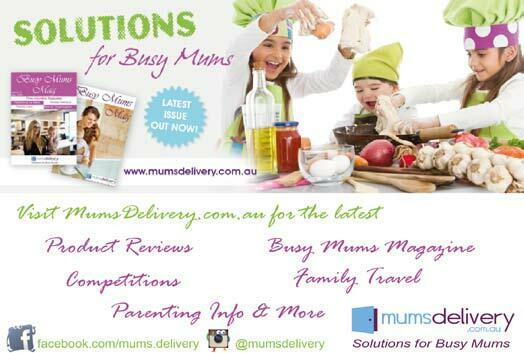 We’re two of the parents who have made the choice to minimise chocolate for our two very young children. Some people wonder what on Earth we actually give our kids for Easter, but it’s surprising how many alternatives there actually is to chocolate! 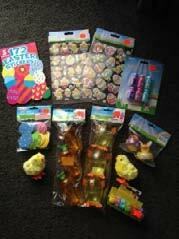 Most dollar shops (pictured is my local dollar shop’s Easter display) coming up to Easter will have hollow plastic eggs (usually about the size of real eggs) that pull apart to put things inside, so an Easter Egg hunt is still possible and fun! are probably plenty of other items that would be fantastic that haven’t occurred to me also! Just remember to keep it age appropriate if you’re hosting an egg hunt or similar. I hope this provides some good chocolate-free Easter alternatives! If you have any other great ideas, I’d love for you to share them with me as a reply below: it’s quick and easy, and the more people who get involved, the more ideas we’ll all have coming up to the big day! 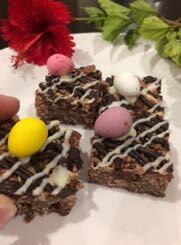 Chocolate Crackle Slice is super easy to make and the addition of Easter eggs helps get your children into the mood for Easter. 125g copha, ( cut into pieces ), 200g dark chocolate, ( broken into pieces ), 5 cups Rice Bubbles, 1 cup pure icing sugar, 1 cup desiccated coconut, chocolate to drizzle on top and Easter eggs for decoration. Step 1 Cream the butter and sugar with an electric mixer until pale and light. Step 2 Add vanilla essence and mix well. Add the egg and mix thoroughly. Step 3 Sift together the flour, cocoa, baking powder, Bi-Carb and salt. Gradually add to the creamed mixture to form a dough. Wrap dough in cling film and refrigerate for an hour. Step 4 Preheat oven to 170oC. Line three oven trays with baking paper. Step 5 Lightly flour the work surface and roll out the dough evenly to a thickness of approximately 5mm. Using cookie cutters, cut out shapes from the dough and arrange on the prepared baking tray. Step 6 Bake for 10-12 minutes on the middle shelf. Allow the biscuits to cool completely before decorating. Step 7 Melt white chocolate according to packet directions. 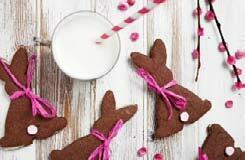 Drop a small teaspoon of melted white chocolate on the bunny’s bottom and top with marshmallow. 1. Pour the almond milk into a small saucepan and warm over a low heat for 2 minutes. 2. Whisk the yeast, milk and 2 teaspoons of maple syrup in a jug. Set aside for 10 minutes or until frothy. 3. Combine the flour, raisins, currants, spices and salt in a large bowl. Make a well in the centre. Add the yeast and milk mixture, together with 1 tablespoon of oil, vanilla, orange zest and 1 1/2 tablespoons orange juice and rice malt syrup. Stir until combined. 4. Transfer to a lightly floured board and knead until smooth and elastic, approximately 5 minutes. Grease a bowl with remaining oil and place dough into the bowl and cover with glad wrap. Set aside for 45 minutes or until doubled in size. 5. Line a baking tray with baking paper. 6. Flour your hands and transfer dough back to the board, gently kneading for a minute. Shape into 12 buns and place onto prepared tray. Cover with glad wrap and set aside in a warm place for a further 40 minutes or until doubled in size. 7. Preheat oven to 160°C. 8. Combine the remaining flour with water to form a smooth paste. Place into a zip lock bag and cut 1 corner from the bag to make a piping bag and pipe crosses onto the buns. 9. Lightly brush with the additional maple syrup and bake for 30 minutes or until cooked through.